M. Night Shyamalan has become famous for his use of twist endings and having a slight career slump up until 2015 when he had a return to form with The Visit. But one big mystery involving his latest picture Split is whether or not this is a continuation of his return to form. Well the twist is.....eh, sort of. Split follows the story of three female classmates (Anya Taylor-Joy, Haley Lu Richardson, Jessica Sula) who are kidnapped by a man named Kevin with Dissociative Identity Disorder (DID) played by James McAvoy. Kevin has 23 personalities living inside him ranging from a reclusive OCD man named Dennis to a 9-year old boy named Hedwig to a mysterious and dangerous 24th personality known as "The Beast" that requires human sacrifice. The film's greatest aspect lies in James McAvoy's performance. McAvoy really commits to pulling off a man with multiple personalities, making you believe him as the different personas living inside one being. The three actresses who play the kidnapped girls also do a very good job. In particular, Anya Taylor-Joy who broke out last year with The Witch. She pulls off plenty of quiet likability to her portrayal of a girl who underwent severe trauma that becomes revealed as the film progresses. I also appreciated how the film was very character driven. There aren't many special effects or scenes of grotesque violence. Its main focus is on the girls trying to escape their prison as well as on Kevin's personalities that take over him in his day to day life. But the fact that it emphasizes so much on its actors is what makes McAvoy's portrayal so great. He has to continuously sell the frequent personality switches through facial and body tics yet he nails it. All of that being said, though, there wasn't a whole lot of tension to be found. It goes on a lot longer than it needs to and without spoiling anything, it didn't feel like it had much of an ending. The ending drags on until it suddenly ends without much payoff. Also, don't go in expecting jump scares every few minutes. It is a very slow burn and requires plenty of patience. There are small chilling moments thanks to the screechy sound effects as well as occassionally dark cinematography that captures the unforgiving, closeted nature of the basement where the girls are being kept. But it's not too scary. So if you go see this, expect a suspenseful character study. 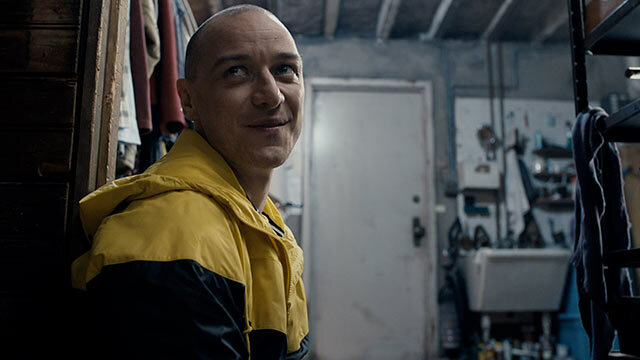 Overall, Split lives up to its title because it features a committed performance by James McAvoy and amazing work from the three main actresses. But it becomes brought down by its rather muddled storytelling and never ending climax. Not M. Night Shyamalan's worst but it's no The Sixth Sense either. Hopefully, he'll do a little better next time around. What Constitutes A Supporting Performance?